Not another boxing movie. Well, yes and no. There must be 7000 boxing movies made in the history of film and yes, this is actually MMA (Mixed Martial Arts - UFC type stuff), not boxing, but still... same same. But this one is so damn good! I was totally caught by surprise how good this film actually was. Aussie Joel Edgerton (Animal Kingdom, The Great Gatsby) and Tom Hardy (Inception, RocknRolla) star as two estranged brothers that grew up wrestling but were separated as their abusive father (Nolte) tore the family apart. An MMA competition with a multi-million dollar pay packet brings them both back into the ring (octagon actually) and they must deal with all the family baggage that resurfaces when the brothers and their father all get back in touch. Anyway, you learn this much from the trailer. I absolutely loved this movie. Yes, I'm a sucker for great fight scenes but the plot to this movie, the plight of the broken family, the acting were all so special. 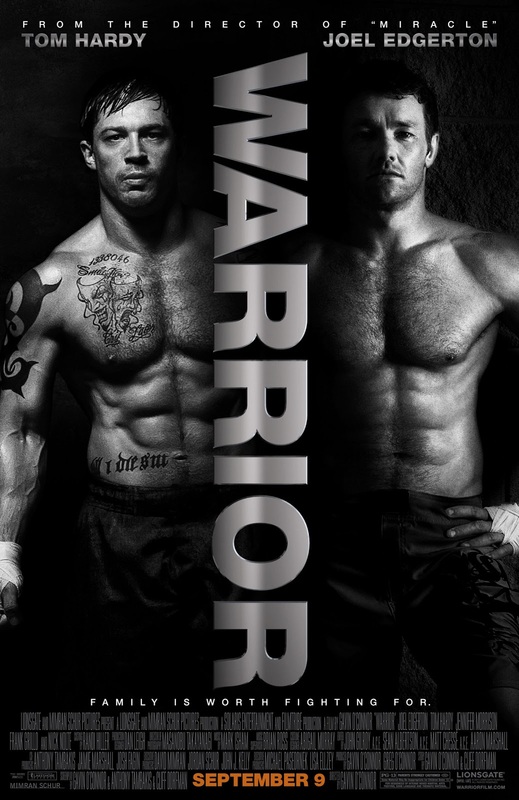 Make no mistake, this movie can be fun if you just want to watch some good old fashion hollywood beat downs but Edgerton, Hardy and even Nolte make this movie so much more. Maybe I'm just a bit of a sap but there was a bit of a salty discharge from my eye balls on a couple of occasions. Every single aspect of this movie felt so real and so believable and even relatable. I decided to watch this movie for 3 reasons. One, it was MMA, not boxing. I was curious to see how they'd make a movie about it. Two, Joel Edgerton. You pay attention when an Australian makes it hollywood. I do anyway. Three, Tom Hardy. I only know Tom Hardy from Inception and RocknRolla but in both outings I was impressed with his work. That being said, in Warrior he lifted the roof off of my expectations for him. Hardy, Edgerton and Nolte gave so much to this movie. It really was quite impressive that they actually hit the nail on the head with the casting of the three most important roles. It's just such a shame that there will be a whole segment of audience that will miss out because they don't want to watch 'another boxing movie'.